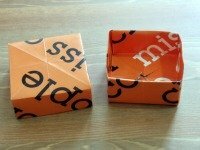 This origami box is pretty simple to make but looks very effective. I'ts made from a square of paper and if you make the box and lid to match you can use it to give small gifts. It looks particularly good when made from glossy or thick paper, so old magazines or large books that have fallen apart are great. In the video below I've used the pages from a peter rabbit book. These are quite thick and make a sturdy box. It would be far too big a web page if I included the step by step pictorial guide that I usually do so.... I've written a PDF file, which you can click on below. This includes all the stages with clear photos and instuctions so you can't go wrong! The box I make in the pictorial guide is made from a fabulous orange leaflet that popped through my door. It's advertising some sort of insurance but looks great made into a box! Recycling is all about thinking in a different way. Detailed Easy To Follow Instructions, With Colour Photos. I hope you enjoy making lots of boxes and recycling all your junk mail. Don't forget that when you have finished with the box you can still pop it into your recycling bin. If you have enjoyed this craft why not sign up to out recycle-news e-zine and keep uptodate with all the new crafts added to the site. The sign up is at the top left of the page.